The SmartPlug is a LoRaWAN class C device that uses the mains voltage as a power supply. The SmartPlug includes an internal antenna. The direct application for the SmartPlug is to control electrical devices thanks to their electric supplies, it can also measure the power consumption of the electric device plugged into it, and measure and evaluate the quality of the electrical mains to which it is plugged. Plug the SmarPlug into a wall socket, then plug an electrical device into it. 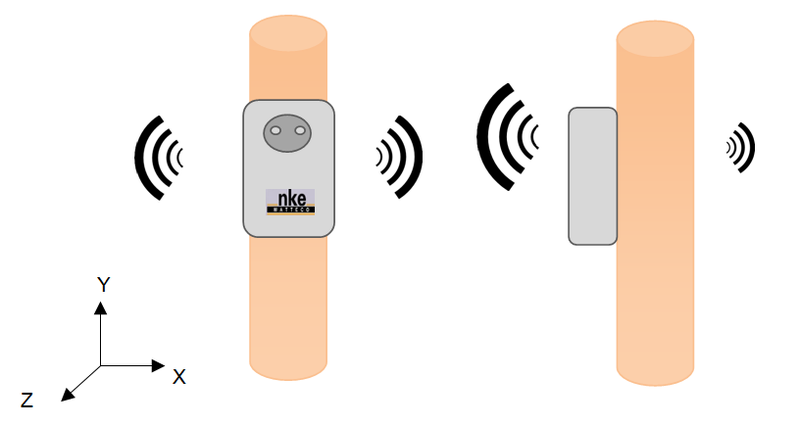 In order for the sensor to operate correctly, the number of obstacles should be limited in order to avoid excessive radio wave attenuation. It is also important to place the sensor as high as possible. In order to switch the SmartPlug ON, plug it into a wall socket. The SmartPlug will automatically start. Green: blinking until the association with a network is done. 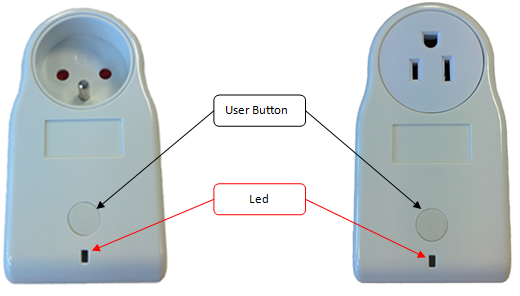 One press on the User Button will change the state of the SmartPlug (ON/OFF). If the SmartPlug is rebooted, it will keep the last state it was on. The SmartPlug device is an awake device. It implements the “On/Off” cluster associated with the output controlled by the relay, the “Power Quality” cluster and the “Simple-Metering-Like” cluster. The device reports the simple metering (EndPoint 0 / Cluster Simple Metering /Attribute Current Metering) every hour. The direct application for the SmartPlug is to control electrical devices thanks to their electric supplies. The SmartPlug is plugged inside a wall socket. Then the device to be controlled has to be plugged into the SmartPlug’s socket. Once this quick installation is done, the electric device can be controlled through the LoRaWAN network to be either powered or not. The SmartPlug also measures the power consumption of the electric device plugged into it. The table below summarizes all the values measured along with their unit. 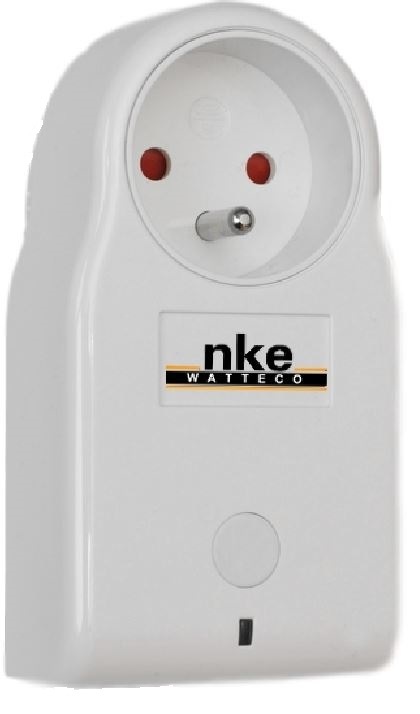 The SmartPlug measures and evaluates the quality of the electrical mains to which it is plugged. The table below represents the available indicators provided by the SmartPlug to evaluate the quality of the mains. → As there is only one On/Off output, the EndPoint is 0 and Cluster “On/Off” is 0x0006. Timestamp and record the Active Energy each time it decreases or increases by 10 W.h. A report has to be sent at least every 10 min. →As there is only one measurement input, the EndPoint is 0, cluster “Simple Metering-Like” is 0x0052 and attribute “Current Metering” is 0x0000. The maximum field has to be 0x800a to have a report every 10 minutes and the minimum field has to be 0x0000 to have a report immediately after the right variation. Report all the measurements used to evaluate the Power Quality (F, Fmin, Fmax, Vrms, Vrms min, Vrms max, Vpeak, Vpeak min, Vpeak max, OverVoltageNumber, SagNumber and BrownoutNumber). These values have to be reported at least every 20 minutes and a minimum time delay of 1 minute has to be set between 2 reports. Finally, an increase or a decrease of 10Vrms must trigger a report. All other delta on the values should not trigger a report. → As there is only one measurement input, the EndPoint is 0, cluster “Power Quality” is 0x8052 and attribute “Current” is 0x0000. The maximum field has to be 0x8014 to have a report every 20 minutes and the minimum field has to be 0x8001 to have a minimum time delay of 1 min between two reports. All the 0xpppp fields have to be configured to 0x00 in order not to trigger a report except for the Vrms measurement, where a delta of 10V should trigger a report, thus the value for dVrms will be 0x0064 (because the unit is V/10). Report the state of the relay every 24 hours and for each variation. → As there is only one relay, the EndPoint is 0, cluster “ONOFF” is 0x0006 and attribute “ON/OFF” is 0x0000. The maximum field has to be 0x85A0 to have a report every 24 hours (60* 24 minutes) and the minimum field has to be 0x0000 to have a minimum time delay between two reports on variation. All the 0xpppp fields have to be configured to 0x00 in order not to trigger a report except for the Vrms measurement, where a delta of 10V should trigger a report, thus the value for dVrms will be 0x0064 (because the unit is V/10). Timestamp and record the Active Energy and the Active Power each time it decreases or increases by 20 W.h and 350 W, respectively. The resolution needed for both measurements is 1 W.h and 1 W, respectively. Timestamp and record an increase or decrease of 30 Vpeak. The resolution needed for the measurement is 1V. A batch has to be sent at least every 3hrs and at most every 10 min. → For the simple metering, the EndPoint is 0, cluster “Simple Metering-Like” is 0x0052 and attribute “Current Metering” is 0x0000. For the Active Energy, the delta will be 0x000014 and resolution will be 0x000001. For the Active Power, the delta will be 0x015E and resolution will be 0x0001. For the power quality, the EndPoint is 0, cluster “Power Quality” is 0x8052 and attribute “Current” is 0x0000. The delta will be 0x012C and resolution will be 0x000a. For all measurements, the maximum field has to be 0x80B4 to have a report at least every 3 hours and the minimum field has to be 0x800A to have a minimum time delay of 10 min between reports. There are 3 kinds of measurements, so it is necessary to manage 3 different labels. The Tag Size to be used for 3 labels is 2. Label 00 can be used for Active energy, Label 01 for Active power, and Label 10 for Vpeak. To configure the batch, a “Configure reporting” command must be sent for each cluster. Beware that such a configuration may generate an excessively fast LoRa frame rate for permanent use.